This is a Kerala version of roasted Piri Piri chicken. Piri piri chicken is mainly a spicy African grilled or roasted chicken served with piri piri/ peri peri sauce. The word Piri Piri here refers to the spice of chili pepper. 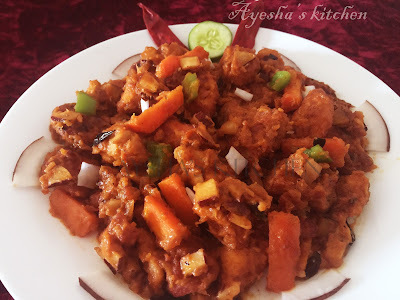 Here I am sharing you the recipe of Kerala style Piri Piri chicken where the Piri Piri stands for the special Piri Piri chili used for the spice and texture of this dish. This is an excellent chicken dish with gravy and the tiny bits of roasted coconut slices makes this dish a heavenly touch. Combine together maida, rice powder, vinegar, turmeric powder, chili powder, and salt with little water and make a thick paste. Marinate the chicken with the above marinade and keep refrigerated for 15 minutes. Then deep fry chicken and keep it aside. Now heat oil (2 tbsp) and saute onions, ginger garlic paste and peeled chopped tomato in a pan with salt. When done, keep it aside and once cooled grind it to a fine paste. Now again heat oil( can use chicken fried oil) and add coconut slices. Saute well till golden and then add the crushed dried red chilies( piri piri chili). Saute for 2 minutes and when done add the onion tomato paste. Let it cook until oil separates. Mix well and add carrot along with the fried chicken. Cook for few minutes in medium flame until chicken is well coated in the gravy. Stir occasionally. When done, remove from flame.